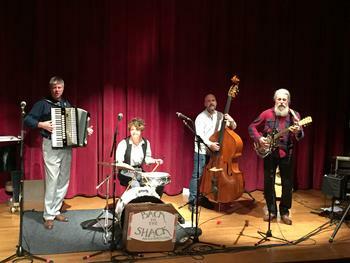 The Bob Long Trio will play acoustic blues, ragtime and jug band music from the 1920s and 1930s, "the old stuff"
The Bob Long Trio will be playing blues, ragtime and jug band music from the 1920s and 1930s, "the old stuff"
New Forest Acoustic Blues presents.......live blues jam on The Bandstand! Acoustic blues, vaudeville blues, jug band...."the old stuff"
Acoustic country blues, Vaudeville blues, jug band...."the old stuff"
Acoustic country blues, Vaudeville, jug band...."the old stuff"
Our Special Guest will be Elsie Franklin. Don't miss this one! I'll be joined on this occasion by Dennis Rigg on harmonica and Jan Anderson on percussion. Our Special Guest will be Ben Gunn…..not to be missed! Acoustic Blues & Folk Jam / Open Mic monthly session hosted by Bob Long. This month's Special Guest is Jon Walsh. All welcome. Bob Long plays the blues with Dennis Rigg and special guest. The monthly Acoustic Blues & Folk Jam / Open Mic. All welcome. This is an evening cruise on the scenic Basingstoke Canal on board the John Pinkerton, a modern, purpose-built narrow boat with live blues, real ales and fish & chips. What a great combination! Always fun to play in this friendly pub! Here's an opportunity to see this brilliant duo on tour in The UK. I'm delighted to have been asked to open for them. This month's Special Guests are the superb blues duo, Nobody's Business. All welcome! This month's Special Guests are Pete Harris and Jon Vaughan. I look forward to welcoming you! Bob Long and friends playing "the old stuff" in Hambone Gallery. Always an enjoyable gig! Free’s Company - the UK’s definitive Free and Bad Company tribute band. From the thunder of the opening drum beat, the hypnotic bass line and searing guitar riff of “I’ll Be Creepin’” which opens the show, you’ll be transported back in time and treated to the best songs from two of the most influential blues/rock bands in the history of rock’n’roll - Free and Bad Company who were fronted by the incredible Paul Rodgers. The band formed in March 2013. A chance meeting between ‘Doc’ Martin (guitars) and ‘Woody’ Woodham (drums) was the impetus to make it happen, however Doc and Tom Shrimpton (bass) had already hatched a plan to form a new project some weeks earlier. Andy Vass (vocals) was recruited shortly after the first rehearsal session as the band were instantly impressed with his strong interpretation of “THE VOICE”! Lastly, the band made contact with local guitarist Andy Crowle and following a successful audition he was invited to provide the last piece in the jigsaw. The band is now in the process of establishing itself as a regular touring outfit around the UK and further afield with a positive reputation building all the time due to the hard work and dedication of all band members. This month our Special Guest will be Jon Walsh (who was due to appear last month but had to cancel due to illness). Friday 14 June will be the first ever Blues Night at Milford-On-Sea, Hampshire. Top of the bill will be Jim Crawford and Ian Briggs, a blues duo of huge talent and experience. Jim Crawford is something of an enigma. Originally from Lancashire, he now resides on the North Devon coast. A shy and retiring man who readily admits that recording studios fill him with dread and that he’d rather go fishing with his dog for company, has none the less, toured much of Europe and the U.S.A captivating audiences with his intimate folk/blues style. Softly spoken, Jim totally surprises his audience when he breaks into song with, as one reviewer put it " a richness of voice you can only be born with." and for years has been revered among professional musicians as a consummate finger picker and slide guitarist. The combination of Jim on vocals and guitar and Ian Briggs on harmonica, is delightful. The event will be at The Milford Community Centre, a splendid music venue which stages folk, jazz and many other performances. The show will be hosted by Bob Long; a local bluesman with a liking for early, acoustic blues, ragtime and jug band music www.bobalong.co.uk Bob explains, “ this event will be the first of its kind in Milford. We are going to put on a high quality blues show and see how it goes. If it’s popular, we’ll make Blues Night a regular event.” In addition to the Crawford/Briggs duo, there will be support from local blues musicians; The Ben Gunn Duo and Bob Long & Keith Miller. In May the Acoustic Blues & Folk Jam / Open Mic at The Platform Tavern will be on Tues 28. As always, all players and listeners are welcome. As usual I'll be hosting this month's Acoustic Blues & Folk Jam / Open mic on the last Tuesday, 30th April. Our Special Guests will be The Ben Gunn Duo, a lively blues and skiffle act which is always highly entertaining. All players and listeners are welcome. This is the best music pub in Southampton. Our Special Guest in March will be Reverend Robert, bluesman from Illinois, USA, who is on tour in the UK. Here's his website http://revrobert.com See details below. Reverend Robert is a master of prewar blues. He has delved deep into the styles of Charley Patton, Robert Johnson and other delta blues giants. In the past two decades he has become accomplished at many other early twentieth century styles including ragtime and early jazz, Hawaiian, African and Caribbean. He combines these styles seamlessly in a combination of infectious rhythm and an authentic acoustic sound. All acoustic players welcome to jam or open-mic. Or just come and listen! Nobody’s Business go back to the roots of the blues with songs from those great bluesmen and women whose music has been an inspiration to so many world famous musicians from BB King to the Rolling Stones. Nobody’s Business will transport you to the cotton fields of rural America, with fine fingerpicking country blues and ragtime guitar from Danny and sensitive harmonica and rhythm guitar from Colin – with the addition of some of their own songs to the mix. These old blues songs recount enduring tales of hardship, love and loss, passion and jealousy – but often with great humour, and Nobody’s Business convey this with their relaxed musical style and easy rapport with their audience. Danny’s love of blues music began as a boy listening to his father’s collection of blues and jazz LPs. He had classical guitar lessons from the age of 12 before acquiring a steel string acoustic guitar and starting to teach himself the country blues fingerpicking style which identifies this music. Danny is also a member of Bristol-based 4-piece band Appalachia. Colin taught himself to play harmonica whilst driving tractors on a farm! A long-time member of blues/rock band Bedrock, Colin has developed an instinctive feel for the emotion of the blues, whether vamping train rhythms on Delta blues songs, or playing high pitched vibrato on more delicate arrangements. This month's Acoustic Blues / Folk Jam / Open Mic at The Platform Tavern in Southampton will be on Tues 29 January, as usual, on the last Tuesday of the month. Our Special Guest will be Jon Walsh, a bluesman equally at home playing solo with acoustic guitar and cranking it up with his high-octane blues band. On this occasion, Jon will be in solo mode and I know it will be pleasure! All musicians and listeners are welcome. Who knows who will turn up? I don't; that's part of the fun! It will be a rewarding way to spend a cold, winter evening with free entertainment. This month's Acoustic Jam /open mic at The Platform Tavern in Southampton is on Tues 27 November. I'm looking forward to being back in The Delta and doing a gig in Clarksdale at my favourite venue. This month's Acoustic Blues and Folk Jam / Open mic is on Tues 25 Sep..
Our Special Guest is Andrew Bazeley, a specialist in acoustic blues, making his first appearance at The Platform. I look forward to welcoming him. All players and listeners welcome! This month's Acoustic Blues / Folk Jam / Open Mic at The Platform Tavern, Southampton will feature special guest, Mo Thomas, a fine blues singer and guitarist. Don't miss this opportunity to see Mo at this excellent venue. All players and listeners are welcome! This month's Special Guest is the incomparable Dave "Sugarhand" McKenzie! I'll be in Clarksdale, Mississippi for this year's Juke Joint Festival. Come and hear me playing the blues with Stan Street at Hambone Gallery. I look forward, as usual to hosting this once-monthly session. All welcome! Special Guest at next week's Blues & Folk Jam / Open mic at the Platform Tavern in Southampton, will be Reverend Robert, from the USA. He is currently on tour in England and has kindly agreed to come along. Rev Robert is a fine exponent of old style country blues. Come and hear him play and you'll love it! This month's Acoustic Blues & Folk Jam Open Mic at The Platform is on Tues 31 Jan.
All players and listeners welcome, including new performers seeking experience of playing in a real venue. A warm way to spend a cold, winter evening! Special Guest; Marydore, a talented and charming singer-songwriter. You're in for a treat! to celebrate the release of my new CD album, Delta Harvest. This is a collection of acoustic blues music recorded in Mississippi last October. For details see the "news" page on this website. The monthly Acoustic Blues & Folk Jam / Open Mic will be on Tues 29 November. This will be the last one this year because in December, the last Tuesday is too close to the frenzy of Christmas and New Year. In January, it's back to normal, Tues 31 Jan. This month's special guests are two charming ladies, Rebecca and Vicky, the front line from the Dorset band, Peachy Jane. You're in for a treat! I'm back from my travels in Mississippi and Arkansas and looking forward to this month's session which as always, is the last Tuesday of the month; Tues 25 Oct. This month's special guests are Danny and Sonny, a very talented young duo....Come and see them so, in years to come, you can say you knew them before they became famous! Hosted by Bob Long. All welcome! This month's Special Guests are The Rezzonators! This month's blues jam / folk and blues open mic at The Platform Tavern is on Tues 28 June. All welcome. Our Special Guests are Walker Broad, aka Sandy and Andy. Don't miss a rare opportunity to catch this dynamic duo in Southampton! Blues & Booze In The Bury! This event, now in its fifth year, combines a blues festival, a real ale festival and a family fun day, raising funds for charities, including The Neurofibromatosis Association (NfA). It is located open-air in The Bury, at the heart of the beautiful old town of Odiham, Hampshire, United Kingdom. The music starts at 12 noon and finishes at 6 pm. Entry is free and there’s plenty of parking. As in previous years, the emphasis of this successful event will be on blues, with both acoustic solo artists and bands. This year’s performers are…. Born in London in the 60's British Blues Boom, Eddie Martin turned professional after being nominated for Best British Blues Guitarist, Band and Album between 1996 and 1998. Since then he has played or recorded with many greats from both sides of the Atlantic, including John Mayall, Peter Green, Buddy Guy, and Taj Mahal. His songwriting seamlessly updates blues tradition to the modern world and his solo and band performances fill even hardened blues audiences with new enthusiasm for the expressiveness and power of this genre. His acoustic style has developed into a percussive blend of traditional blues slide and finger-picking blues styles with flamenco rasguerdo techniques. These he combines with rack harmonica playing and foot percussion in the style of the one-man-blues bands such as Duster Bennett, Joe Hill Louis and Dr Ross. Adam Franklin is a superb exponent of blues and ragtime music from a Golden Age of the legendary recordings of Charley Patton, Son House and Tommy Johnson. With a voice that is both powerful and soulful and equally at home on guitar and resonator ukulele, Adam’s performances are intense, energetic and highly entertaining. Brought up in a family of musicians and entertainers, Adam carries on the tradition with energy and passion. He makes his way through the pre-war American songbook, using his guitar as a band in a box and the floor as a foot-stomping drum kit. Mostly pre-WW2 acoustic blues, ragtime and jug band music...."the old stuff"......Come and join us for a fun evening in this delightful city centre venue. The monthly "acoustic blues jam", hosted by Bob Long, now re-named "blues and folk open mic" at The Platform Tavern, Southampton, will be on Tues 31 May. An evening of acoustic blues, good food and drink in this very pleasant venue. May be outside if the weather is fine. This is the monthly acoustic blues jam / open mic session, hosted by Bob Long, at The Platform Tavern in Southampton; the best music pub in the city. All players and listeners welcome...including young folks who want to gain experience in prformance in a real venue. This month we will have the rare pleasure of legendary harp player, Keith Miller, from North Lincolnshire, sitting in. This is the regular, monthly, acoustic blues jam / open mic which is always on the last Tuesday of the month. The event is hosted by Bob Long. Our Special Guest in March will be the legendary Pete Harris. The Platform Tavern is the best music pub in Southampton and a warm, friendly place to play. All singers, players and listeners are welcome; especially young folks who want to gain experience in performing for a live audience in a real venue. This is the regular, monthly, acoustic blues jam / open mic which is always on the last Tuesday of the month. The event is hosted by Bob Long. The ethos behind Thurdsday Blues is to put on the best we can find/afford and have a bloody good night once a month. To this end our favourite trick is to put on a band with an international reputation or aspirations and team them with local unsung heroes. Sometimes the offers we get are too good and the 'unsung' heroes have included Michael Messer, Delta Echoes, Snakebite and Sonny Black. We are a non profit organisation and any money we make or scrounge is spent on artists. This is a monthly event, hosted by Bob Long www.bobalong.co.uk, held on the last Tuesday of every month. All welcome! This is Sonya's legendary annual blues weekend featuring blues, booze, good company and optional relaxation. This event, now in its fourth year, combines a blues festival, a real ale festival and a family fun day, raising funds for charities, including The Neurofibromatosis Association (NfA). It is located open-air in The Bury, at the heart of the beautiful old town of Odiham, Hampshire, United Kingdom. The music starts at 12 noon and finishes at 6 pm. Entry is free and there’s plenty of parking. As in previous years, the emphasis of this successful event will be on acoustic blues. This year’s performers are….. Monthly acoustic blues jam / open mic hosted by Bob Long. All welcome. This new restaurant in downtown historic Helena welcomes the Wild Hogs! This is Wild Hog Festival weekend. This new restaurant in historic downtown Helena welcomes the Wild Hogs! This is Wild Hog Festival Weekend. This year my gig is on the train! Step back in time. "Hobo" the Mississippi Delta Railroad on the Juke Joint Festival Express runninig excursions during the festival. No charge. Selective trips with authentic railroad cars running from historic Clarksdale Passenger Station to Hopson Plantation. I'm playing the blues on the train leaving Clarksdale at 11.30 am. At 1.30pm the return train leaves Hopson and arrives Clarksdale 2pm. Monthly blues jam /open mic hosted by Bob Long. All welcome. This month's Special Guest is the incomparable Lewis Cohen, one of the best of the new generation of UK bluesmen. A monthly acoustic blues jam / open mic session hosted by Bob Long in Southampton's best music pub. All blues players and listeners welcome! This month's Special Guest, back by popular demand, is the amazing Lewis Cohen, an acoustic blues slide guitar specialist with powerful vocals reminiscent of Son House. Bob Long plays acoustic blues and ragtime at the Basingstoke Beer Festival......Real blues and real ale! A monthly acoustic blues jam / open mic session hosted by Bob Long, at Southampton's premier music pub. All players and listeners are welcome. This month's Special Guest is Adam Franklin, a phenomenal acoustic guitarist, ukulele player and blues singer. This is a cosy restaurant and bar and a good place to be on a Sunday evening. Bob Long will be playing the blues. Acoustic blues jam / open mic hosted by Bob Long with Special Guest, Andy Broad. All blues players welcome; listeners too. Monthly acoustic blues jam / open mic hosted by Bob Long. Special Guest this month: Phil Thorne. All welcome; players and listeners! Blues and beer festival, open-air, daytime, with family fun. Fundraising for charities. Open air stages in daytime, Delta Blues Museum Stage evening, juke joints night-time! Monthly acoustic blues jam / open mic, hosted by Bob Long. All welcome. Monthly acoustic blues jam/open mic hosted by Bob Long. Special guest: Adam Franklin. All welcome. The monthly acoustic blues jam / open mic, last Tues day every month, hosted by Bob Long. All welcome.